The first poster for Rian Johnson‘s Looper has gone online. The futuristic thriller takes place in a world where time travel exists, but is only used on the Black Market. When the mob wants to kill someone, they send the target 30 years into the past where a contract killer (Joseph Gordon-Levitt) does the dirty work. Things are going smoothly until Gordon-Levitt’s future self (Bruce Willis) is sent into the past to be killed. I adore Johnson’s previous movies, Brick and The Brothers Bloom, and Looper is one of my most-anticipated films of the year. I’m still distracted by the make-up design that was used to make Gordon-Levitt resemble Willis, but Johnson has earned my trust. 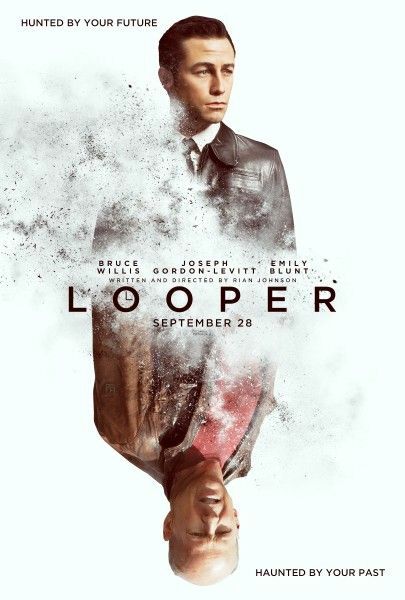 The poster borrows the Inception font (I believe the font is officially called “Gotham”), and while I love the tagline, Gordon-Levitt looks like he’s CG. Handsome CG, but still CG. Hit the jump to check out the poster. The film also stars Emily Blunt, Paul Dano, and Jeff Daniels. Looper opens on September 28th.